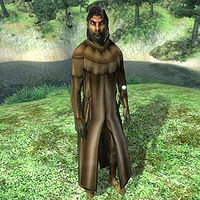 Aymar Douar is a Dunmer enchanter who is a devout worshipper of the Daedric prince Vaermina, and can be found with his fellow worshippers Aviera Nirol and Tenville at the Shrine of Vaermina. Speak with him to find out what offering Vaermina requires. He wears monk robes with a pair of clogs. He also carries an iron dagger along with a small amount of gold. As an enchanter, Aymar possesses a respectable arsenal of spells. He can cast major spells from the Alteration, Illusion, Mysticism, and Conjuration (with the exception of Bound Armor) schools of magic, as well as major and minor spells from the Destruction school. If you speak to him before giving the proper offering to Vaermina he will say, "Who are you, who dares to walk in the House of Shadow? What business do you have with the Lord Vaermina?" If you ask Aymar about Vaermina he will reply, "Here we worship Vaermina, praying for her to grant us true visions. What is your business here?" Your two options include telling him you have no business there or telling him you wish to speak to Vaermina. If you choose the former he will say, "Then perhaps you should go, lest Vaermina take interest in your dreams." Choosing the latter will lead to him replying, "To speak with Vaermina, you must offer a black soul gem to the Daedra Lord." Aymar Douar spends day and night worshipping at the shrine of Vaermina. Aymar's class is "MerchEnchanter", and therefore in the Construction Set merchant services are enabled (with 5 gold). However, he will never negotiate with you and it is not possible to invest in his store. Therefore, he does not actually provide any merchant services during the game. This page was last modified on 4 January 2019, at 03:12.